Lotte Friis won the 1,500 m freestyle race in a time of 15:49.59 at the 2011 World Swimming Championships held in Shanghai, China. Each frame in this analysis is 0.1 seconds apart. The swimmer recovers with a long, almost-straight arm action. It is interesting to see if it impacts the underwater arm-action of the opposite arm, as would be expected because of Newton's Third Law of Motion. Frame #1: The left arm enters well in front of the swimmer's shoulder after having reached forward over the water. The right arm is well into the propulsive phase with considerable drag force being generated by the hand/forearm propelling surface (the turbulent water following the arm's movement verifies the drag action). The swimmer is streamlined. The left leg is dragging in a streamlined manner while the right leg begins to kick to counterbalance the entering left arm. Frame #2: The left arm reaches forward and is fully extended as is the left shoulder. The swimmer has rolled almost flat. The right arm begins its exit while seemingly still pushing back. The loss of propulsion caused by the hand-arm surface being angled can be seen through the diminution of the amount of drag-resistance turbulence associated with the arm. The right leg continues to kick in its counterbalancing function. The swimmer is streamlined. The head looks down. Frame #4: The left arm bends at the wrist, an action that would not produce any appreciable propulsive force. The right arm has exited the water. The swimmer is streamlined. The right leg continues to drop deeper creating more resistance; a much longer resistance pocket than in the previous frames follows the leg and streams off the toes. There is a possibility this low leg-position assists the body to rotate but it still resists forward movement. The right leg rises possibly also assisting body rotation. Neither leg is in a position to generate any beneficial propulsive force. Frame #5: The forearm and hand of the left arm have been repositioned through two movements; the elbow has flexed and the upper arm has medially rotated resulting in an "elbows-up" posture, which is a good position. The upper arm has abducted to a small degree. The swimmer is streamlined. The legs are still wide apart, both being in positions that increase resistance [they are both outside of the turbulence "shadow" that is created by the body]. Frame #6: The left arm produces considerable propulsion. The upper arm begins to abduct more and the hand/forearm increases in its verticality. The swimmer is still streamlined and the legs remain apart, almost in the same positions displayed in the previous four frames. The head begins to rise and look ahead which is unnecessary and will increase resistance. Frame #7: The left upper arm and hand/forearm move together producing considerable mostly direct propulsive force. The head looks forward and rises as do the shoulders, ostensibly being the initiation of the breathing action. Streamline begins to be disrupted as the lumbar curve starts to hyperextend in response to the rising front portion of the swimmer. As a result of that disruption to streamline, turbulent resistance can be seen on the swimmer's suit in font of her hips. The right arm approaches entry. The left leg has risen and the preparatory to kicking (to counterbalance the vertical forces of the right arm entry). Frame #8: The body position of the swimmer has lost streamline. The deep curve aspect of the body's posture runs from the face, down the torso, to the hips, and then back up along the legs. The turbulence created by the curvature can be seen by the pockets of milky water separating from the hips (the bottom of the postural curve). The head has risen and begun turning to the left side. Considerable resistive turbulence has been created by the face (the milky water on top of the shoulders and in front of the face) with the head in this position. The right arm has entered and also created considerable turbulence, which is clearly seen as the deep light area on top of the arm. The left arm continues propulsion. While the hand/forearm remains "vertical" greater propulsive forces are created than the resistive forces the develop. This position is nearing the end of proficient propulsion. The legs cross as the left leg kicks to counterbalance the vertical forces created by the right arm entry. Frame #9: The head is high and continues to turn to the side. Inhalation has not begun. The amount of resistance created by this inadvisable head action can be seen by the milky water that is obscuring the neck and head. Overall body-streamline is still disrupted. The left elbow rises as the body turns. The lower left arm is beginning to "angle" and lose propulsive force (the forces are lost by sliding upward and by parts of the lower arm moving at different velocities). The right am presses down creating resistance that is incompatible with forward propulsion. Much vertical and negative horizontal force is created by the right arm in this action. The left leg kicks to counter balance much of the right arm's vertical force. Some vertical force is also counterbalanced by the rising left arm as it initiates extraction in the recovery. Frame #10: The head has turned well past 90 degrees (looking to the side). The swimmer continues to rotate the body to the left. The left arm is almost out of the water. The right arm presses down and with the forward movement of the swimmer creates a turbulent trail that shows its resistive forces are vertical and negatively horizontal ("anti-propulsive"). The left leg still kicks to counterbalance the right arm's press. At this time, nothing is occurring to maintain the swimmer's propulsion. Frame #11: The swimmer continues to breathe with the head to the side and slightly up. The left arm is recovering straight. The right arm continues to be long and presses down with no propulsive value (instead of having been repositioned and creating horizontal propulsive forces). The upper right arm is abducting but loses substantial potential propulsive force by this forward and downward "press". The swimmer's streamline is still undesirable. The trailing legs at least provide the specter of a cross-over kick, which is undesirable at any time although usually necessary to partly correct some very bad fault, which well could be the straight arm recovery and its interaction with an excessively high and long breathing action. Nothing occurs in this frame that would maintain or improve propulsion. Frame #12: The right arm continues downward and does not produce any forward propulsion. This deep arm action could reasonably be explained as counterbalancing a high straight-arm recovery. There is a possibility that the arm is performing a lever function and the abduction of the upper arm is used to pry the swimmer forward. If that occurred it would not be a very large or proficient function. At best, it might reduce the amount of negative acceleration that is occurring in this stroke phase. The swimmer continues with the head on the side and the body-hips turned. The legs trail close together. No or only a small amount of propulsion occurs in this frame. Frame #13: Although partly flexed at the elbow, the right arm is very deep, the position being magnified by the extreme roll of the shoulders. In this frame, the arm perhaps is generating a small horizontal component force. The recovering straight arm has passed vertical but the head's position has been yoked to the movement time of that recovering arm. As the recovering arm passes its movement apex the head begins to follow it and return into the water. The legs continue to trail. Frame #14: The recovering left arm sweeps forward and causes the shoulders to rotate. It breaks the dependency of the right arm on its movement. Consequently, the left arm is repositioned by an increase in elbow flexion and synchronizing the hand/forearm press with adduction of the upper arm. The sudden readjustment to this new and more productive position would cause a momentary loss of any propulsive force from this arm. However, the earlier frame analyses indicatde that little propulsion, if any, was generated by this arm's action before this stage of the stroke. The head continues to turn back toward the pool bottom as the recovering arm is thrust forward and down toward the water. The legs trail with the right leg rising. Frame #15: A position very similar to that demonstrated in Frame #1 is displayed. Frame #16: A position very similar to that demonstrated in Frame #2 is displayed. The breathing action of this swimmer needs to be changed. Instead of rising and looking forward, the head should remain down (as is shown in Frames #2 and #3) and turn from there on a horizontal axis so that inhalation will occur in the bow-wave trough created by the head. The movement should be independent of what the body or any other part of the swimmer does. It can be timed with actions, such as breathing outside of the effort phase but should not be yoked to other actions. By executing an independent head action, it is possible to inhale below the water surface level. As well, the swimmer's current long turn to the side and continued elevation creates resistance and diminishes the propulsive power that can be produced by the "other side" arm. Effective breathing really requires the turning action to be as brief as possible, with as little movement as possible, be independent of any arm action, and be timed with the exit of one of the arms when power production (the "effort phase") is smallest. The swimmer demonstrates a classic two-beat kick. Each leg kicks to counterbalance the vertical forces created on entry by the other-side arm. If ever there was a clear demonstration that the leg-kick in crawl stroke is non-propulsive, this swimmer's stroke is it. At no time are the swimmer's legs or feet in a position that could produce any propulsive forces of any benefit. This world champion 1,500 m swimmer is far from a proficient performer with any technical features that might be worthy of modeling. 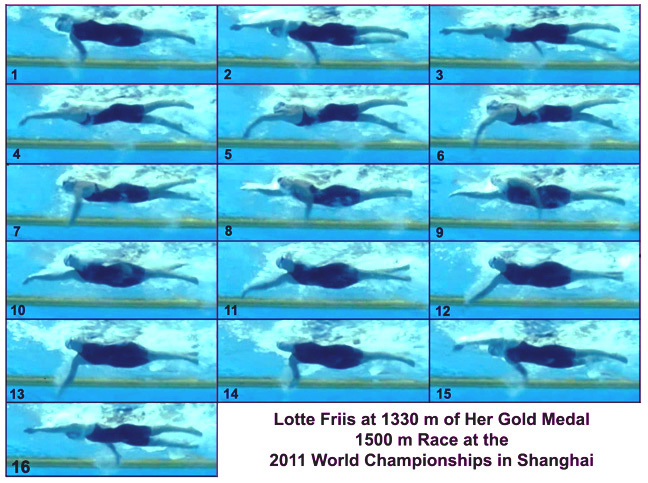 Knowing the movement features that are unproductive suggests the performance capability of Lotte Kriis is not fully achieved. At most, the swimmer shows 1) how not to breathe, and 2) why one should not use a straight-arm recovery. Lotte Kriss has much to improve upon.